You can enjoy a wide range of music too. We listened to everything from the sparse electronica of Neneh Cherry’s Broken Politics to Dave Brubeck’s Take Five and these little speakers take it all in their stride. They have the dynamic expression, detail resolution and tonal sophistication to handle it all, and enough stretch in their abilities to get better even when the rest of the system is upgraded. 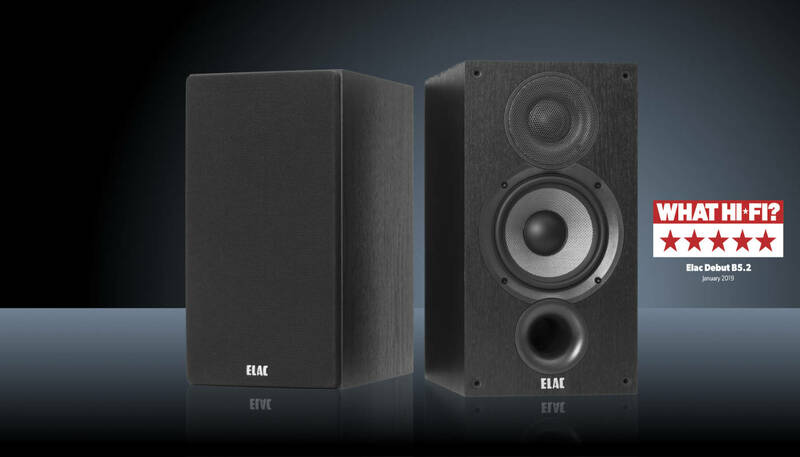 Elac has been in the speaker business since the 1980s and has made many fine products in that time. It’s fair to say that these new Debut B5.2 speakers should be considered one of the company’s finest efforts, particularly when their price is taken into account. If the established budget speaker brands aren’t worried about these boxes, they should be. The Debut B6.2 can hold its own in this company, but if imagery is your top priority, the little ELAC really does make it big. When material is softer and quieter, the delicacy and clarity offered by the tweeter is most impressive. It picks out the minutiae buried in the depth of the action and is easily heard, but without a hint of stridency or sharpness. The cymbal strikes on theextreme right of the soundstage at thebeginning of Stevie Wonder’s Higher Ground shimmer off into the distance deliciously and the hi-hats are snappy and taut. The bass output kicked out by the compact F5.2 is quite an eye opener. Never once does it sound lightweight or as if it’s struggling. Instead, bass digs deep and with a highly accomplished sense of timing. "...the music appears completely detached from the cabinet. It spreads across the room and hangs in space." "Integration with that tweeter is one of the speaker's real strenghts." "...they are capable of very interesting tonal resolution and they couple this with a musical top to bottom togheterness that is a constant surprise." "The "Khallık Fernını" opener sports very wispy cymbal and brush work across a widely spaced drum set. Some of it is so fine as to nearly fall below the treshold of audibility. The 4pi Plus.2 lowered that threshold and with it lifted a small damper on decay lengths." "The illusion of paralleled performers playing the same notes was heightened. The breathiness of the solo bass ney was enhanced as well. Close-mic'd piano had clearly more overtone action, more energy spray off the strings. " "Clearer separation is one aspect of it and as such most apparent on dense material. It's like turning up overhead lights to increase contrast." "The 4pi's effectiveness comes as no surprise. It is perfectly logical and predictable... why haven't we heard more about this brilliant invention?..." "It's Elac's 4pi radiation which makes the decisive difference... the 4pi Plus.2 occupies a league of its own. In my book, that makes it an especially super tweeter indeed." "This speaker has no weaknesses and has grown all walks of life. It tops its all-round skills with audiophile virtues such as spaciousness, fragrant resolution and precision to the lowest layers. Not cheap but worth every penny." "I wrote down almost two pages on my personal notebook only descriptions of how these speakers behave in terms oftransients. As for the body of the instruments, the materialization and dynamic musical event , the FS 609 are simply score of 10 ! It is impossible not to yield to its enormous qualities and revere the brand even more by the sheer consistency in providing the consumers with extremely honest and consistent products, from the most modest over to its top line." We Believe: A huge speaker that can give you everything you desire for sound and sound experience, but not for beginners. Midrange and an opulent bass." "... Even with high and highest levels, the 509 was acting totally stress free in the Bass." "Large floorstand loudspeaker with classy high gloss finish cabinet. The excellent two-way coax driver has a mechanical adjustment range. Very dedicated, analytical sound in the positive way. Also excels at large throw distances." 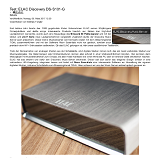 Price / performance: "sehr gut"
"... With the 509 you can buy not only a great dynamic, full and the transparent box, but also one which adapts to different acoustic listening rooms. Only these should not be too small." "ELAC's use of their JET ribbon tweeter is the hi-fi equivalent of a turbo charger; it magically wipes away so many of the pitfalls of small speakers by using a superb treble transducer that wouldn't disgrace a speaker at several times the price." "...Hooked up to a beefy transistor amplifier (if it's valves you're running they've got to be particularly punchy) and a decent front end, the Elacs really take your breath away. They're far more sophisticated than is expected at the price, with none of the squawking, screeching and boofing of many sub- £ 1,000 standmounters." "The BS 243's inherently transparent nature, allied to realistic three dimensional imaging, rhythmic alacrity and extended, delicate and sparkling treble make them an essential audition for those looking for grown-up transducers that take up a small space." "... frequency response analysis shows they are almost ruler-flat, meaning, they will provide great tonal accuracy and balance, but also low colouration..."
"The ribbon treble unit Elac use is a good example of this, measuring far flatter than dome units, and this gives the BS 243 an unusually even treble characteristic above 4kHz that will almost certainly translate into smooth, clean treble, of exemplary ribbon quality." "As for the bass? That, if anything, was the surprise package. It was pacey and effective but without strain or boom. " Exemplary alignment and stability characteristics. Moderate Sensitivity - 86 dB at 4 ohms." Charismatic, artistic, vibrant, pleasantly warmed, smooth, and distribution." "They are just beautifully shaped and flattering - transparent, fine saturated, with good light. The fact that they remain perfectly aligned with the center, I had not to write ... The scene is more focused ... and thus - locations are perfect, that is accurate and saturated, as indeed is closely related to the plasticity of sound." "Bass goes down surprisingly deep; Electric bass, double bass and drums convincingly depicted realistically and with enormous energy and great precision in the listening room"
with their superior coverage. Also, the THD and decay is very first quality." "The FS 247 Sapphire Edition combines the sweetnes and ultra-wide imaging of Elac's proprietary JET tweeter with pace and neutrality across the rest of the spectrum. Impressive from the outset it is about as music-genre agnostic as loudspeakers get and very easy to live with. The somptuous good looks, fine attention to detail, accessories and superb finish make this sleek German speaker excellent value"
"The first thing anyone will notice when hearing ELACs for the very first time is the sound of that JET tweeter. It is breathtakingly sweet and articulate. Suddenly metal domes sound hard and 'ringy' in comparison to the JET's sophistication and detail. It sounds clean, crisp and seamlessly well balanced throughout the top end of the spectrum with wide, wide, projection. Clearly the design of the tweeter's baffle will encourage a considerable horizontal soundstage you can measure in acres with a very generous listening sweet-spot"
"spatial and dynamic resolution, dry, contoured bass, bass and dispersion control, rubber feet and spikes." "Plus: a great timing, excellent sense of rhythm, dynamics, high resolution and very flexible." universally neutral tonal balance, this speaker plays no favorites with musical genres. Plays well accented and with good detail both loudly and quietly. Bass is extended and substantial. The Elac manages to completely disappear, i.e. the music decorrelates completely from the enclosures. "The sound is characterized by an unusually high correlation in the upper frequency range, with an almost perfect transition between the tweeter and midrange. Put another way, it is difficult to hear that you listen to the speakers and not the real thing ... "
"All vowels are simply masterful rendered and Elac sounds clearly better singer than the Audiovector. Katie Melua lovely voice clearly drawn up in front of us "
"... a speaker that sounds very well balanced and comfortable, no matter what type of music you challenge them with. 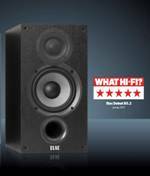 It is especially in the top of the frequency range that great impresses FS 249, but bass response is also very deep and precise. ."
ELAC FS 249 assured the Hifimaailma listening jury, winning a EUR 5000 floorstanding speakers comparison test. "Sound has a nice purity and unity, above average ... and is a universally appealing package for all forms of music." "The speaker sound is a natural presence ... without intruding; it was a vibrant and inspiring to listen acquaintance." The sound is sparkling clear with a detail that goes beyond mainstream speakers." Sound Rating: 6 stars - "Especially recommended"
"Universal artists, endowed with musical sensitivity. For a fairly modest price, you get advantages of more expensive speakers." "... Put a live album by Patricia Kaas, and you will see that they are spiritually rich and transmit voice, even in this flawed record - except that sibilants could be a little quieter. On the other hand, it is the sharpness of execution coupled with the ability to penetrate the emotional essence of the songs that makes BS184 truly universal! satellite music lover." "Incredibly, the power and vitality sprayed by Elac BS 184..."
"...on the Elac, one could not escape the impression of a freshly cleaned window pane." "Balanced-clear, very dynamic and enormously alive playing loudspeaker." "Well-balanced with a slightly decreasing, but extensive bass... THD continuously at a low level in bass, amazing reserves." "Juicy, plastic, slightly warmed, softened and smooth, clean and subtle"
"The colour of the FS 187 columns seems to be both warm and clean, smooth texture, devoid of naturalistic roughness. Midrange leads... round and soft, persuasive liquidity and "lyricism" - female vocals come out really beautiful, and are not lifted and brightened"
"... Technically ELAC has a lotg going for it. Sensitivity is high, which is never a bad thing provided that the tonal balance and coloration level's don't suffer - which they donn't in the FS 189. It has one of the most neutral tonal balances of the group..."
"Elac's claim of 90dB sensistivity for the FS 189 accords very closely with our measured pink noise figure of 90.1dB. This - marginally the highest sensitivity of our group - is, moreover, achieved without recourse to a punishing load impedance. In fact the minimum impedance modulus of 4.3ohm - right on spec ... indicate that Elac presents the most bening load here, although it still demands an amplifier capable of driving low impedances"
"On-axis frequency response errors of ±2.2dB and ±1.8dB, 200Hz-20kHz are confortably the lowest in the group, as is the excellent pair matching figure of ±0.7dB over the same frequency range. The cumulative spectral decay waterfall is first class too..."
"The FS 67.2 - an attractive design, impeccable workmanship - including its gloss lacquer surfaces - and useful features. The FS 67.2 provides, despite its low price, a loudspeaker with consistently high-quality technology, making the corresponding sound: Elac FS 67.2 can satisfy also the demanding music listeners. Interested parties need not consider the balance between the priorities of optics and acoustics, because the FS 67.2 excellently meets both needs." 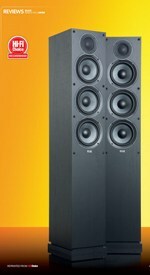 "I like the revised Elac FS 67.2 not only for the looks: especially in sound the slender tower speaker have much to offer. Whoever hears will not believe that these excellent speakers can be called for only 700 €. Sound tip - and to listen to the dealer"
"ELAC is building with the small tower speaker line FS 67.2 60.2 one for its price range perfectly crafted design speaker, the fine glossy coat front with the contrasts of the silvery chassis reflects sound too. Fine lines and amazing dynamics characterize the crystal-clear, but never on the field tending sound. Respect and Price Tips are the deserved reward." "Plus: Very honest, balanced, high - resolution box with super dynamic and precise articulation. Minus: Too honest for difficult shots :) "
"Sonically and visually convince us the Elac BS 63.2, so that we can recommend to all those who are looking for a nice speaker with compact size for home listening." 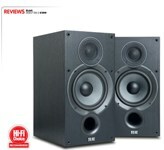 "The sound of this inexpensive bookshelf speaker was well balanced and clear in the whole band. The tweeter is just fine sewn to the midbass driver..."
"Very good job of the designers in the configuration of this model. The frequency response and THD measurements show very, very good results. The frequency response has a small unbalance and is close to zero. This means a smooth output at all frequencies, in the operating range..."
"Compact two-way active monitor in technology with an classic assembly and attractive lacquer cabinet. Analog plus digital input in cinch and XLR. Remarkably powerful and neutral sound even at high volumes. Extremely cheap!" Audio Video (Poland) 01.2012 Editorial recommendations!